My feet hurt. You know that kind of “Festival Foot”, when the balls of your feet are sore from tramping through fields all weekend? I peeled off my slightly soggy socks to find four, sore, bright red patches. At least my Festival Foot did provide an excuse to lie around in the unexpected Welsh sunshine, contemplating the incredible weekend I just spent at Off Grid Festival in Devon, England. I wasn’t planning to go, but for the past five months I’ve been helping to promote the Festival. As I posted news of each fascinating new workshop, speaker or band, I gradually convinced myself what an amazing event it would be! The Off Grid College offered a platform for pioneers to talk about practical sustainability and appropriate technology. 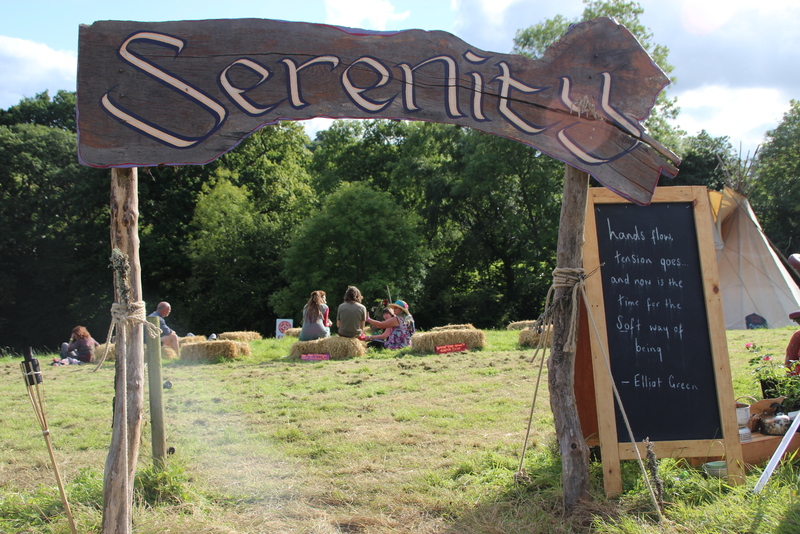 Low impact building, solar installation, permaculture and medicinal foraging were just a few of the themes on offer. At Thrive, it was all about all things healing. Massage, mindfulness and yoga, as well as in-depth discussions around activist burnout, trauma and the future of elderly care. At the Community Convergence space, discussions ranged from The Power of Networks to Co-housing to the Economics of Happiness. 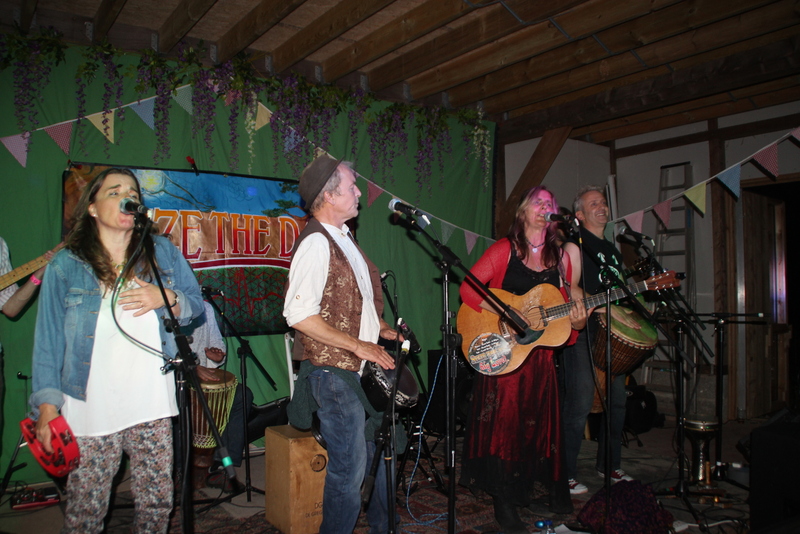 Plus, of course, there was uplifting, original music from live bands all weekend. As usual, my Festival experience was filtered through the lens of my camera, which gave me an excuse to grill various inspirational people about their passions. I also learned a lot about the art of podcasting from fellow festival journalist Carl Munson, aka the Barefoot Broadcaster, who set up his “field” studio to interview passers by and had them uploaded within minutes. Unlike my interviews, for which you’ll have to wait a bit, you can hear his exchange with Guy Coxall, Compliance Officer for CBD (cannabidiol, the non-psycho active ingredient in cannabis) right now! Carl’s Barefoot Broadcasts are a from of alternative media, which, in this time of “fake news” are more important than ever. I spent more than 15 years working as part of the Undercurrents collective, reporting on environmental activism. We trained hundreds of people to create their own media and to get their voices heard, enabled by the revolution in video camera technology which made high quality recordings both accessible, portable and affordable. Now, everyone carries the technology for citizen journalism but instead, what do we use it for? Spruiking ourselves on socal media and pinging selfies around the world in an effort to gain attention. What a waste. Alternative media relies, more then anything, on an alternative ideology. Offering a fresh view on the world requires contemplation, discussion, a willingness to question and to go against the mainstream. The off-grid culture provides a natural home for alternative media, since it challenges all the mainstream systems and approaches which underpin culture and way of life. Off Grid means a challenge to the growth economy, the religious hierarchy, the mass approach to education. To Big Pharma, Big Oil and Big Banking. To top-down government, just-in-time commerce and housing as investment. To prioritising profit over people, humans over animals, and development over nature. An alternative media practitioner needs a strong stomach, a deep curiosity and a fearless attitude. 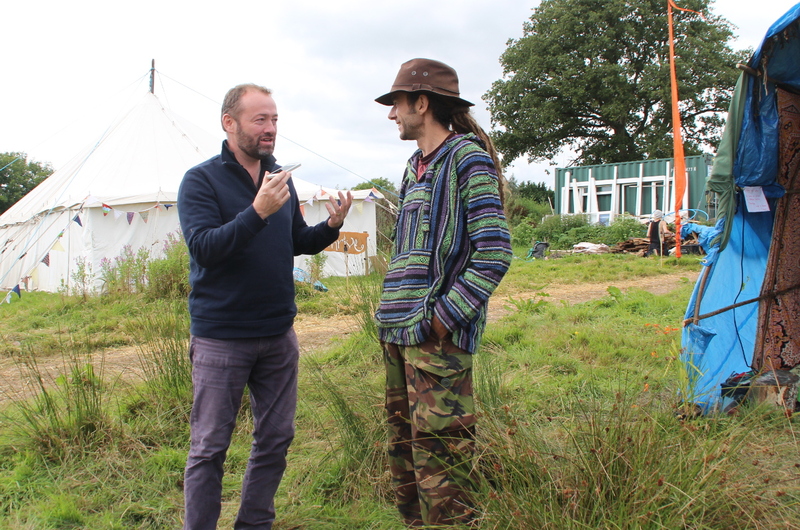 My involvement with Off Grid Festival, combined with this latest damning report from Reporters Without Borders, has reminded me of the importance of alternative media organisations and of how the people that contribute to them need our support. With this in mind, I’m making this the first in series of blogs featuring journalists and filmmakers who, in the widest sense, are spreading the Off Grid message. I’m beginning with James Light, a talented film maker who gave up his job in television news 8 years ago in order to tell the stories he thought really mattered. James has made some beautiful films for the Off Grid Festival but this year, was unable to attend because of a calamity which put his van off the road and himself into debt. As part of this profile, I’m sharing his crowdfund page, in case you feel like helping him get back into action. James’ inspiring film “What’s Your Story?” is the true-life documentary about people who are daring to ask life’s ultimate questions. “Through sharing and listening to each other’s stories and experience we not only make everyone feel like a valued member of society, we also help drive innovation, as though sharing our thoughts and ideas we will be able to harvest more wisdom from our collective intelligence. Together we are stronger and through changing our story we can change the world.” To this end, James is a committed supporter of Off Grid Festival. Hope is a big theme for James, having overcome personal tragedy when his brother died young of epilepsy and going on to pursue his dream of becoming a film maker. Support James’ fundraiser to help repair his van and get him filmmaking again!